Information: Elba Augusta Agata Colomba Farabegoli Gurzau, teacher and author of Italian dances. Elba, Italian and international folk dance enthusiast, was born on April 17, 1909, in New York City. Elba Augusta Agata Colomba Farabegoli was the only child of educated Italian immigrants Francesco (Frank) Farabegoli and Virginia Bimbi Farabegoli. Her father worked in a restaurant and eventually operated a successful restaurant of his own at 59 West 24th Street. In 1921, what was to be a short visit to Italy was extended, for Gurzau and her mother, into a nine-year stay. At the age of twelve, she enrolled in a preparatory school in Florence, Italy, where she studied Italian and other subjects. She took private lessons in her father's hometown of Cesena and passed the examinations for a high school level diploma. She then went on to study at the teacher's college, Istituto Magistrale, in Forli, Italy, graduating in 1928. Upon returning to New York in 1929, Elba attended New York University (N.Y.U. ), receiving a B.S. degree in Education in 1932 (N. Y. U. gave her credit for her college work in Italy). During her time at N.Y.U., she took a class taught by leading Italian-American educator Leonard Covello. Covello's class, "Methods of Teaching Italian," included the broader concepts of community centered schools, the use of Italian history and cultural materials, and intercultural education designed to teach an appreciation of other ethnic groups. Elba also student taught at DeWitt Clinton High School, where Covello worked full time as head of the Italian department. She was influenced greatly by Covello's educational concepts and dedication to the Italian-American community. At his suggestion, she joined the Italian Teacher's Association and attended the first formative meeting of the Folk Festival Council of New York in 1931. The latter affiliation was pivotal in her life. As the Folk Festival Council grew over the next decade, Elba served as festival and party chairperson and as a member of the planning committee. In 1931, at the urging of Covello and others, she organized an Italian folk group called the Italian Choral Society, later renamed Coro D'Italia. Its aim, according to the founders, was to foster and spread knowledge of Italian folk songs and dances. Elba did the routine organizational and administrative work, as well as researched dances, performed, and collaborated on programs. In 1934, she started a second group under her own direction, the Esperia Dancers. Both groups were affiliated with the Folk Festival Council. Elba's interest in folk dancing, particularly Italian dances, was sparked by these experiences. Due in large part to her positive experiences in Italy and the influence of Leonard Covello, Elba took pride in being of Italian descent. Very early in life, she was able to reconcile and even celebrate her ethnic origins. The atmosphere of the folk dance parties and festivals held by the council was one of toleration and celebration of all nationalities, and it was in this environment that Elba learned an acceptance of herself and others. Her experience and education also equipped her to be a bridge between the old and new country for many Italian immigrants. In the early 1930s, Gurzau accepted a part-time position with the Bronx Young Women's Christian Association (YWCA) to establish a new program for Italian women. The project led to the founding of five "Italian Mothers' Clubs" designed to expose the immigrant women to American life outside the household. The clubs generally met once a week for field trips or to hear speakers on topics such as health, family relationships, child guidance, American society and Italian achievements. As the number of clubs grew, Elba demonstrated not only her ability to work with immigrant groups, but to put together a series of part-time positions during the economically troubled Depression years. Folk dancing, however, was not left behind. She continued her activities with the Folk Festival Council and the Choral Society and sometimes led international folk dances at various locations in the city. To aid in her work, she also took courses in social work at N.Y.U. Both her activities with Italian folk culture and Italian Mothers' Clubs complemented and supported the efforts of Covello and others in the Italian community to better understand and improve the immigrant's situation. In the summer of 1942, Gurzau was recommended to staff at the Philadelphia International Institute (once affiliated with YWCA), as a candidate for the position of activities director. They were looking for someone with experience in international folk dancing, and immediately offered her the job. After several weeks of indecision, she decided to take the position which required moving away from her family and New York friends. The decision marked a long and mutually beneficial relationship between Elba and the International Institute (renamed Nationalities Service Center [NSC] in 1963), one which helped NSC meet its goals and provided her with support for the development of numerous folk dance events and folk groups over the next thirty-five years. After Elba arrived, folk dance activities became a rapidly growing part of the NSC program. Initially, she held weekly folk dance classes led by friend and dance instructor, Eddy Nadel. These were very popular, and when Nadel was unable to attend, Elba taught the dances herself. Eventually, monthly folk dance parties were added to the schedule. Each month a different nationality group was featured, with music and dance illustrated and taught by members of the local community. As much as possible, Elba emphasized authenticity in the dances which were performed. These events, too, were well attended, culminating each December with the popular Christmas Folk Dance Party. Immediately following World War II, Elba also became actively involved with the Philadelphia Committee for Italian Relief. She chaired the committee for the first three years of its existence, during which time a great deal of food, clothing and medicine was sent to the war torn country. As a volunteer, she wrote letters to donors, organized fund raising events, and handled the administrative work of the committee. She became well known among the local Italian-American leadership in Philadelphia. In 1948, she married Titus Gurzau, a Philadelphia restaurant owner whom she had met some years earlier in New York. The following year she resigned her position at NSC and made plans to attend the International Congress and Festival of Folk Dance in Venice. Elba was accompanied by Eddy Nadel, then director of the Harvard Folk Dance Society, Priscilla Urner, a recreation specialist, and her husband. During the trip, the group gathered local folk dances from Italian groups both at the festival and in the countryside around Venice. This research gave her the inspiration and much of the basis for her 1964 book Folk Dances, Costumes and Customs of Italy. The birth of Elba's son, Adrian, in 1953 did not stop her involvement in outside activities. She continued to participate in folk dance events throughout the city. Working on an hourly basis, she planned the monthly dance parties at NSC, as well as stimulating the formation of two new groups in 1954, the Folk Dance Demonstration Group and the Folk Dance Leaders' Council. The former was begun to meet the many requests for a performing group, the latter to encourage cooperation and sharing among dance leaders. In addition to this part-time and volunteer work at NSC, Elba taught dance to numerous Golden Age groups including the Germantown Leisure Hour Group, Lansdale Golden Age Club, and the Friendship Group of Trinity Lutheran Church, Germantown. She organized dance activities at area retreats and, in 1958, helped organize the Italian dance and choral group, I Vivaci, at the request of the Sons of Italy. 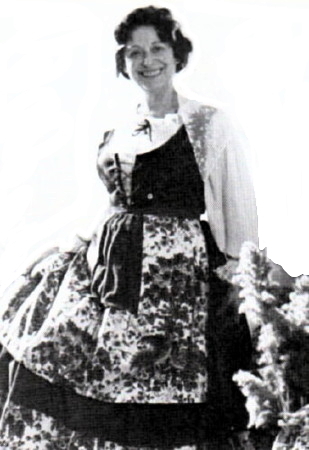 Throughout the 1960s, Elba pursued her interests in Italian and international folk dance via the many activities at NSC and those of the folk dance leaders' and demonstration groups. In 1967, she went back to NSC in a full-time capacity as coordinator of English classes for foreign students. The 1970s were a period of new creative work and study. In 1972, she founded a new and successful Italian dance group, I Ballerini, with whom she continued to dance and direct some thirty to forty performances a year. In 1975, she completed her M.A. in Education at Temple University, specializing in teaching English to speakers of other languages. In 1977, under her leadership, NSC initiated an Italian Folk Arts Project. The one-year project explored and documented the folk traditions of Philadelphia's Italian community. The end of the project was marked by a conference on Italian folk arts to which numerous folk groups were invited. One result was the founding of the Italian Folk Art Federation of America (IFAFA), for which Elba served as first president and guiding force. On June 2, 1975, Elba was awarded the title of Cavaliere by the Italian Government because of her long service to new arrivals to the United States and because of the publication of her book Folk Dances, Costumes and Customs of Italy. In 1977, Elba was assigned by NSC to a special project to stimulate and keep alive the folk arts and culture of Italy among Italian-Americans and others in the Philadelphia area and vicinity and integrate them into the ever-evolving fabric of American culture. In 1981, Elba Elba retired from NSC, the folk dance parties, teaching English, and hours of volunteer work. But her continued involvement in I Ballerini, IFAFA, and an Italian folk singing group, assured her creative and organizational handiwork in Italian-American programs across the country. Elba Gurzau passed away in June, 2003. Bal del Truc, sound recording, 1985?. Folk Dances, Costumes and Customs of Italy. Elba Farabegoli Gurzau, Folkraft Press, 1964 (revised 1964, 1969, 1971). Folk Dances, Costumes and Customs of Italy. Elba Farabegoli Gurzau, Folkraft Press, 1964 ( 2nd edition revised 1981, and 2000). Salterello di Romagna, sound recording, 1985? Papers: 1920-1985 - Includes diaries, correspondence, writings, pamphlets, brochures, photographs, records relating to her early life in NYC and to numerous Italian-American folk dance organizations in NY and Philadelphia. Organizations include Folk Festival Council of NY, Coro D'Italia, and Esperia Dancers, all of New York City; I Vivaci Choral and Dance Group, Folk Dance Leaders Council, Folk Dance Demonstration Group, I Ballerini Dance Group, Italian American Folk Arts Federation of America, all of Philadelphia. The papers also document Gurzau's career as a teacher and social service worker with the New York YWCA's Italian Mother's Club program in the 1930s, Philadelphia Nationalities Service Center, 1945-1982, and Philadelphia Committee for Italian Relief, 1940s. They include drafts and research materials for her two books. Correspondents: Thomas Cotton, Leonard Covello, Michael Herman, Mary Wood Hinman, Reed Lewis, Patricia Parmelee, Eddy E. Nadel, Vyts Beliajus, Frank Farabegoli.